Floral nail designs range from pretty, feminine looks to spicier, much more sultry versions of this iconic nail art. Choose your design to match your mood, personality or the occasion. This bold red nail features a pink tip and a perfectly executed blue, white and yellow flower with a crystal in the center. The polish surrounding the flower design is slightly raised to call additional attention to the details. Classic french nails are delicately embellished with rings of pink and white flowers in this daisy-patterned manicure. A splash of red glitter contrasts a sunny white and yellow floral nail design for a festive yet feminine look. The hibiscus alludes to the sweetness of a summery vacation and beachy breezes. Let your nails reflect the deliciousness of a Hawaiian getaway with artfully placed images of this gorgeous bloom. You're never too old for pretty pink nails; a great shade of pink works for any age from eight to eighty. Yellow flowers add a hint of playfulness to a classically pretty pink-tipped nail. Walk on the wild side with floral nails that are dark, dramatic, and a little bit vampy. The violet flowers really pop on these sharply shaped black-tipped nails. Small, simple flowers accented by crystals add an elegant touch to this pale lavender manicure. The size and placement of the flowers varies from finger to finger to keep the look fresh. This icy blue background makes an eye-catching pop of color for the flowers and vines displayed on top. Crystals form the center of each of the flowers for some three dimensional bling. This unusual manicure features bright orange hibiscus blossoms on four of the nails. Each of the nails is subtly different, showing varying flower sizes, including some lines and dots to simulate the inner pistils of the blooms. Polish off your glitter nails perfectly with a multi-colored nail design. The effect is fresh, fun and pretty. Floral nails are a great way to dress up your fingers for any ocassion. 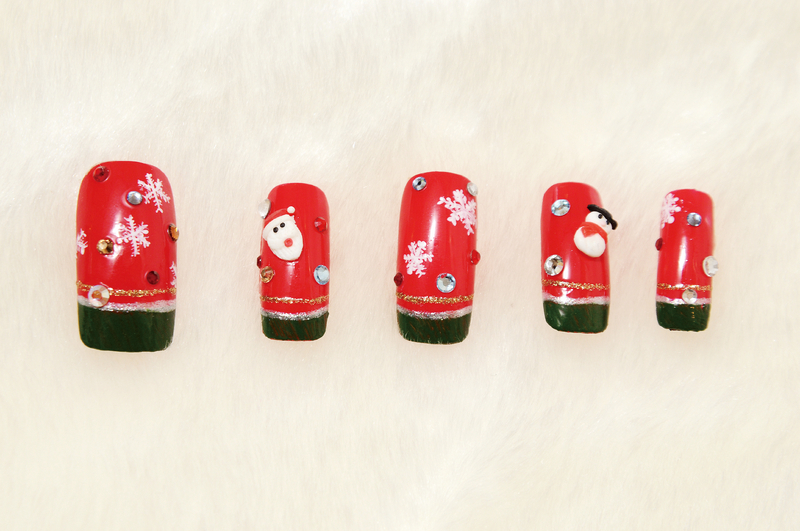 Get inspired with some beautiful nail designs and make your own nails something special.